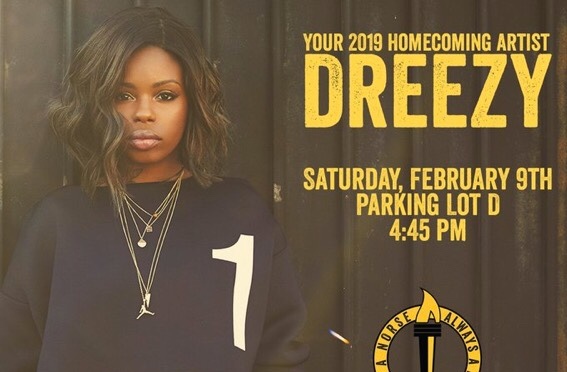 After plenty of student speculation, NKU Homecoming announced on Twitter Friday that Chicago-based rapper Dreezy will be performing at the Homecoming Concert on Saturday Feb. 9. Dreezy is known for her album “No Hard Feelings” that hit #15 on the Billboard Top Hip-Hop Albums Chart, which featured hits like “Close to You” featuring T-Pain, “Body” featuring Jeremih and “We Gon Ride” featuring Gucci Mane. Vice Magazine’s sister publication Noisey crowned her the “Princess of Chicago Rap” after she released her first viral song at just 18 years old, and she was nominated for Best New R&B Artist at the iHeartRadio Awards in 2017. Director of Homecoming Programming for APB Alexia Ball said APB is “thrilled” that Dreezy is coming to preform. Dreezy is playing NKU’s Homecoming Concert fresh off the launch of her new album “Big Dreez,” which was released Jan. 25. The concert is part of the homecoming festivities and will be following a tailgate in Lot D. After the concert, the men’s basketball team will be playing Oakland in BB&T Arena. Last year’s homecoming performance was 2000s throwback hip-hop artist Ying Yang Twins. The concert is free for students to attend.